When it comes to the best CRM software, you should not only focus on what to choose, but why to choose a software that’s heavy on your pockets. Let’s understand everything about CRM software, its need and its usage. By the end of this article, you will surely understand which software can give you a upward graph in your overall income. Let me take you one step ahead with a small story and a little about businesses today. When monopoly was fading away, they used to promote with slogans like, “We’ll spoil you for choices” and they quite did that to our forefathers. Today, that statement has taken a whole new definition – You query for one product (or service) and are flooded with thousands of options. The more educated you become on marketing the right choice by weighing and evaluating features, reviews, warranties, etc., the more you feel baffled than helped. No wonder, predicting customers’ buying behavior is so unpredictable for businesses. Top that with a cut-throat price competition and you can picture your customers leaving your sales funnel like sand drifting from a fist. No business wants to go through that. No business should go through that. Now, we know that it’s the relationship that sells – not the product, not the service, not any feature or price. So, for a thriving business it is crucial to develop a healthy and ever flourishing relationship with the customers. A relationship that not only keeps them loyal to you, but also turns them into your advocates fetching you organic leads. And who doesn’t want that? Thus, investing time to understand the needs, wants, habits, likes and dislikes of your customers is primary. Not only that, you must also know what others are saying about you and your competition to identify your potential customers. This is where a good Customer Relationship Management (CRM) system comes into play. Before we jump to naming the 10 best CRM software, let us focus on how they can benefit your bottom-line. CRM organizes and manages your acquired customers efficiently to increase sales and expand market share. A good CRM system facilitates social listening and analysis which highlights customer complaints and feedback to work on. Such follow up practices give your business a competitive edge and creates sustainable growth. At every point of contact, such as the company’s website, live chat, telephone, direct mail, social media, marketing materials, etc., customers leave data. Learnings achieved through compilation and assessment of this data help the marketers design superior buyer personas & lifecycles which further help in tending to customer queries and pain-points better. However, you must note, that although all the latest CRM systems offer automated support and artificial intelligence (AI) interface, not all are made equal. Different systems serve different businesses. Hence, the CRM software for your organization must be chosen carefully with no necessary feature spared. Below is a list of the top 10 CRM systems of 2016. Salesforce is an all-in-one cloud-based customer relationship management solution. This software has almost everything that an organization needs. Although it is built to cater the needs of large businesses and enterprises, there’s a ‘small business’ edition too offering all CRM tools at an affordable price. Salesforce is user-friendly with features like, lead generation, opportunity & contact management, workflow automation, sales forecasting, etc. The company is one of the top-scoring CRM service providers and is expanding its third-party marketplace of apps and add-ons to stay on top. Flexible customization in sync with the growth of the business. Zoho is another powerful CRM software which provides all the core functionalities free of cost. Moreover, it offers you the flexibility to access your data anytime anywhere through Zoho CRM mobile app. These two key factors make Zoho a popular choice. Even if your business is doing great without CRM, you can still benefit from it. So, if you wish to understand what difference a CRM system would make, you can go for Zoho. It is free, easy, customizable and offers a 360-degree view of your sales funnel. You can identify trends, increase efficiency, spot opportunities and reduce costs. Enterprise ready with uptime guarantee, IP restrictions and audit logs. Infusionsoft CRM software is the best pick for remote teams that seek to automate and streamline sales and marketing. This program works well with computers and smartphones making it a useful adjunct for working-on-the-go culture. It streamlines all customer data by its unique lead scoring and evaluation system that informs sales teams if a lead is still “hot”. Considering customer information, such as demographic, purchase histories, buying patterns, product interactions, etc., it enables superior segmentation of customer database and tailored messages, while also taking care of the duplicity of the information. Additionally, it has a calendar function that allows the sales personnel keep track of appointments and automates office tasks as per the schedule. Detailed business intelligence clubbed with flexibility of remote working and a feature of staying on top of things makes this software so useful and sales-focused. Streamlined task and calendar management from one single dashboard with easy access to individual contacts and appointments. Sugar CRM is known for building extraordinary customer relationships with its powerful, affordable & adaptable products. It is designed to analyze a business’s current needs and overlapping with present opportunities to leverage information. The CRM removes major complexities that businesses today face during customer relationship management. SugarCRM has industry-specific capabilities with deep integration and unparalleled flexibility which gives full control over the direction of your business relationships without compromising over anything. Unrivalled customer support and efficiency. One thing that all Infor Epiphany users say is that that the software understands how crucial is maintaining effective customer relationship for an organization. It provides a holistic picture of the current situation with target metrics and information on how to hit those targets. The CRM software finds use across industries – hospitality, banking, media, telecommunications, etc. – by offering the best-of-breed marketing & sales automation and customer satisfaction. Using its smart customer interaction intelligence technology, Infor Epiphany develops a customer interaction hub which bridges information and comes up with correlations to understand the individual customer needs and identifies opportunities to win over them. This software helps marketers stay in touch with all teams (sales, support & customer service) all the time, thus enabling maximization of impact of every interaction across the entire customer lifecycle. For Retail industry, it gives customers a personalized experience on all channels with social listening, personalized offers and meeting customer demands and preferences effectively. As the name suggests, Intercom is built for quick communication, decision making and meeting customer expectations, then and there. It is an advanced cloud-based CRM software that gives necessary information to the staff (customers’ feedback & suggestions) and is more focused towards increasing the overall productivity of the sales and marketing teams. Intercom is a simple, prompt & personal CRM software with multi-channel, live customer support resolving customer queries at a blazing fast speed on any platform possible, be it mobile app, email, live chat or via. social media. It facilitates faster collaboration behind-the-scenes avoiding surprises with a shared team inbox. Seamless customer support on various platforms (app, email, social profile). Pipedrive is designed on a proven sales methodology that focuses primarily on activities that drive deals. The dashboard provides a clear visual interface with required actions, organized data and a set of features to stay in control during the complex sales process. Hence, it gives you clarity with facts and stats at all levels. Due to this, it is the favorite of the sales pros. While being sales-focused, it is easy and intuitive CRM software which categorizes deals by their sales stage. This not only brings clarity, but develops sales momentum, assorts priorities and refocuses efforts accordingly. Along with efficient workflow management, Pipeline can be used for complicated projects and loyalty rewards programs too. Multiple level filters for easy sorting and statistical analysis. Apart from doing its regular job of organizing customer database better, Highrise CRM software assists in keeping an eye on the recently contacted customers and the results of those communications. The best part is that all this information is centrally stored which makes Highrise a well-planned system that adds more lifelines to the business. It is straightforward and uncomplicated with a limited, but most important, set of contact management features. Even if you had stored the details previously in Gmail, Outlook, Excel, MailChimp or any other 3rd party app, then import is just one-click away. The app is known for its simplicity as it avoids unnecessary advanced features and is great if you are a small team looking for automation and better management of sales cycle. Integration with 3rd party communication apps and tools, like MailChimp, Billomat, Freshdesk, Groove, PodBox, JotForm, Wishpond, iPhone app, etc. TeamSupport is one of the leading software for CRM and can be customized to fit any needs of an organization. Living up to its name, TeamSupport assists in maintaining ‘help desk support’ effectively. Additionally, it maintains a private cloud to render client support services cohesively decreasing the instances of miscommunication. Using its ticket automation service, it allows the support staff to flag messages helping in prioritizing the queued customer requests. To make query redressal even faster, it comes equipped with a knowledge base tool that suggests clients possible solutions to their issues. Likewise, it has several other tools that facilitate self-service and customer community forums. Customer-centric features with advanced reporting system. What differentiates Punchh CRM software from the rest is its ability to connect your business with your customers and keep them engaged with a world-class suite of loyalty tools. With Punchh, you can create amazing surprise & delight loyalty programs. It has a user-friendly, web-based interface which supports customer-friendly mobile apps with which comprehensive, targeted loyalty strategy through gift cards and online ordering can be implemented. While it provides a great room for creativity, it comes built with traditional programs like point-based, visit-based and tiered membership gaming and much more. With 360-degree insights and automated 1-on-1 communication, you not only retain the existing customers, you also create new ones along the way. Automated as well as interactive customer feedback system with social referrals to increase brand ambassadors and trust-driven sales. 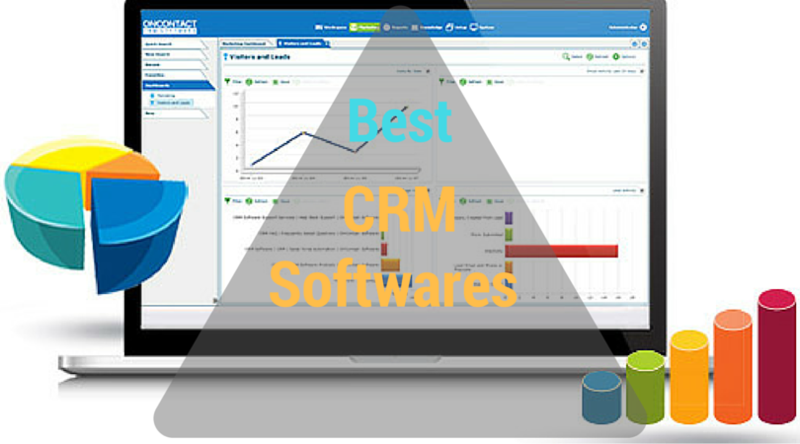 The variety and flexibility of use has made all these 10 CRM software the top and most favored in the industry. Each one offers astonishing features and tools for improving your business relationship with your customers to maximize your sales and market share. While all of them help collate and organize all customer data at a single place, different customization features allow them to be used as per the organization’s unique needs. Now, unless your business offers a proprietary product or service, it needs a CRM system. And even if it does, are you sure that in the coming years it cannot be replicated? Or that somebody wouldn’t come up with a better offering? If the answer brings even the slightest of doubts in your head, you must give your business a smart CRM strategy today! Try one or try all, but don’t forget to drop in your comments how your tried CRM system turned out for you. Any reason why you didn’t mention best free CRM options, like Bitrix24 or SuiteCRM? Yes, no doubt these are also the good option.. but in this article there are only top 10 CRM software are explained. This article is sufficient enough to describe the latest CRM & its worthiness.. Thank you Jaspal for this informative article. I was looking for a CRM company for my start-up but now i have few options because of you. Can you please tell me how to contact them? just go to there contact page and send them a mail about your queries. Good list. Are all these software support ERP Navision. Quite interesting list Jaspal! I don’t know why Agile CRM is not in the list but, I’ve been using Agile CRM for more than year now and I’ve say it’s working really great for me when it comes to Marketing automation. A really good source of information and great list of CRM Software. This post is a very useful for businees people and they can get a quick eye-view on CRM SOftwares. From this post we can compare which CRM software is best for my business. I like to add Kapture CRM also on that List. I have using Kapture CRM since last one year and I recomend to smal and medium size businees to go with Kapture CRM. It’ is fully integrated Mobile CRM Platform, creating a unified interface for all your sales and marketing activities. Support is great! Hello! I just would like to give a huge thumbs up for the great insights you have here on this post. I will be coming back to your blog for more soon.